I haven’t been very good at celebrating milestones. Today is our 12th wedding anniversary. Last year, after making reservations at a couple of restaurants, Faith and I decided to eat at our nearby hawker centre, much to the consternation of my sisters, who thought I should be putting in more effort. The year before that, on our 10th anniversary, we skipped celebrating altogether because we were taking care of Joshie who was one week old at the time. This year, I saw a promotion for lobster at $1 at The Boiler and thought I should do something nice for once. Not being able to keep secrets from Faith, I told her where we were going and what food to expect. “Looking at the pictures on the website, there’s going to be crab, lobster, corn on the cob…”, I said to her as I checked out the menu online. “Corn on the cob! Yum!”, came her response. I don’t know if you guys have ever experienced it: the moment you know that you married the right person. This was one such moment for me. Our 23 years together have been marked by so many of these moments where I sit back and marvel at the beautiful person you are. The time you showed such grit when you shared a tandem bike with me and we made it up that steep hill; or when you understood and didn’t judge me for the frustrations I felt when my parenting skills didn’t cut it. You have filled our 12 years of marriage with so many of these amazing moments where I thank God profusely for joining our lives together as one. As our children grow and slowly become more independent of us, I am thankful that I have you by my side as we walk this next stage of our family-life, taking a more active role in serving the young people in church whom God has blessed us with. You remind me constantly of how good life is; and how Christ longs to come into fullness of this - this life together which fills our cup to overflowing - with His bride the Church. May our lives and our service reflect the spiritual and heavenly reality. May He have the pre-eminence. While the early morning’s heavy rain had lightened up, the sky was still pealing with thunder and dark clouds. I wanted to take the train with Anne and shelter her with an umbrella because she needed to walk without the cover of shelter from the MRT station to school. I was still a little hesitant, in part because I wanted to make sure she would be ok, and also because I didn’t like the feeling of not having done everything humanly possible. Like an archer, this was one arrow I had to learn to let fly. And I didn’t want to deprive her of the opportunity to find her own strength and build her resilience. It’s a lesson I’m still getting used to. As thunder fills the skies, I’m continually praying her flight be buoyed by the grace of God. The trains broke down last night. Thousands upon thousands of Singaporeans were on their way home, only to find themselves stranded. Muslim commuters who had fasted the whole day were now stuck in traffic, and I can only imagine the very keen edge of hunger and thirst they must have felt as the promise of food and family shifted back a few more very long hours. To add insult to injury, it had only just been reported that the CEO of train operator SMRT had his pay doubled in less than three years. But out of the barrage of anger poured on the internet, there were people who saw the problem and got down to trying to solve it. Some folks brought food to the overworked SMRT staff, offered car rides to people who might need it, and Uber suspended surge pricing, choosing not to profit from the train failure. We should be setting our minds on coming up with innovative solutions to these issues that affect us on a national scale. Over the years we have started to languish in our own complacency, content to pay a little to outsource these responsibilities to corporate monopolies or even the Government. “We’ve paid our taxes, now solve my work-life balance”; or “we’ve paid our train fare, it’s your job to ensure that I get to where I need to every single time”. These expectations no longer seem unreasonable because we have become so used to this model of problem-solving. Our heavy dependence on domestic helpers and educational institutions in bringing up our children, or on CPF - a forced government savings scheme - to solve our retirement financials; we have chosen to specialise very narrowly on our responsibilities of our day job, because “we’re paid to do it”. But there are many responsibilities that do not come by virtue of a job title or pay. I hope we widen our perspectives to see that we are beholden to our forebears to make our progeny better than ourselves. To leave problem-solving to corporations and governments is sub-optimal and archaic. Nimble, disposable, highly-skilled quick and dirty communities provide a strong layer of national security on top of the established system. So while many who hope to insert themselves into established institutions of authority jump on these opportunities to demand the rolling of heads, they forget that you can only be a martyr once. Heads rolling does nothing, serves nothing, and should be used sparingly, such as for incidents that display an individual’s lack of integrity or gross negligence. That something failed should not cause us to lose people with precious experience. They should definitely be held responsible, not only to account for, but also to fix the failure. Armchair critics cannot help us here. We should be seeing more discussions, like whether a Uber-like network of citizen drivers can be activated as a contingency measure when public transportation is crippled; or how we can create greater redundancy in our transportation networks. These discussions solve problems. Kicking out the CEO - not so much. Ingenuity and social-mindedness, accelerated through times of adversity, are very key traits we’ll need for our nation’s next 50 years. I received my certificate from the Ministry of Defence earlier this year. My duty to the country, as far as having to commit to annual military training, had been fulfilled. The relief and satisfaction came with a bittersweet tinge. As a close military mentor told me, “you’ll still be serving the country in other ways”, and he’s right. I always will be. But there’s something about being in the military fraternity and privy to its many traditions. 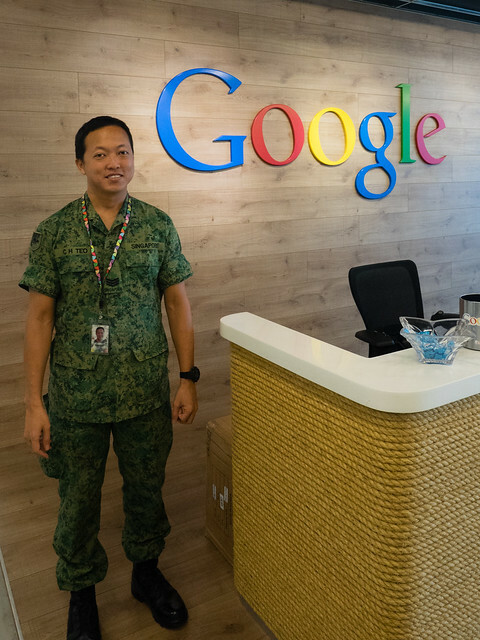 Celebrating SAF Day by wearing our military uniform to our workplaces isn’t exactly the most established practice, but it’s one I decided to honour when it started 3 years ago. The following year, a few more brave souls at work joined in. I started working at a new place this year, but decided to uphold this young tradition anyway. It was nice to find out that friends at the old workplace did too. I realised how young they were. Faith stood behind me as I processed the digital photos, and we both uttered at the same time, “Our boys”. Each one, so full of youth, vitality and promise. Each one, so precious to the loved ones around them. Each life, never to be wasted carelessly in war, but to be carefully nurtured to their fullest potential in useful, faithful, diligent service. 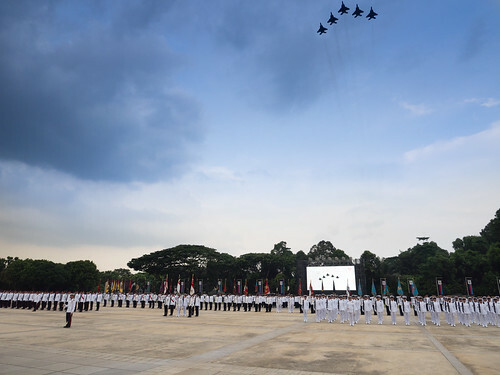 As part of Singapore’s (and the SAF’s) Golden Jubilee, more than 500 men from SAF’s pioneer batch were invited to the parade. Looking at the many faces seated through my lens gave me a mind-meld through time. 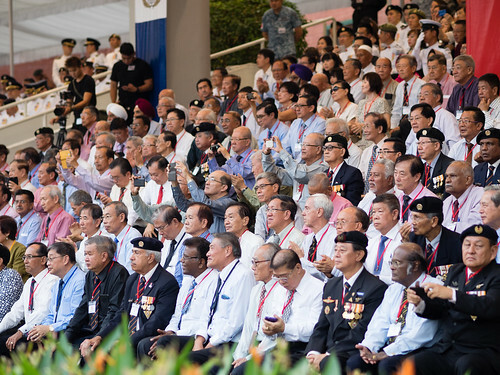 How these men were once the young, vibrant soldiers that stood on the parade square, and gave the fervour of their youth into safeguarding the country we live in today. 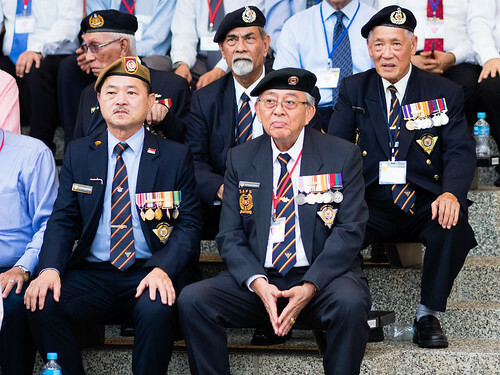 Some of them, proudly adorning berets and medals earned over years of service, each one perhaps a father, grandfather, uncle, teacher, friend. Our fathers. 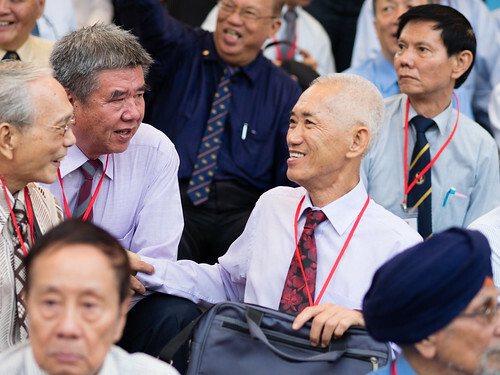 You can feel their joy at meeting each other, the same camaraderie we enjoy with our reservist brothers, steadfast after all these years. 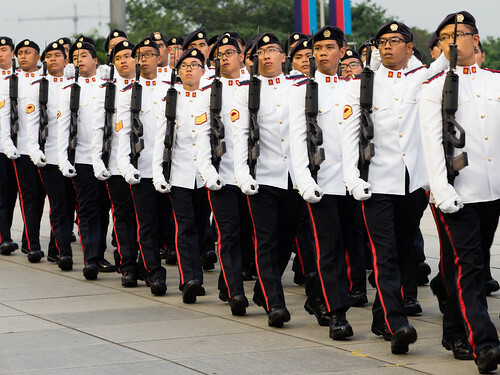 These 50 years of soldiering and guarding our nation is a legacy now passed down to every Singaporean. We face very different challenges from our forebears, but their spirit of determination, resilience and adaptability lives on in us.